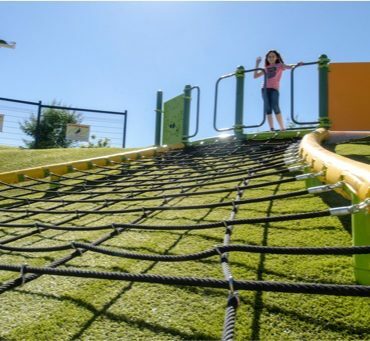 Whichever solution you choose, Playground Grass™ offers play surfaces more durable, easier to maintain and safer than any other option available. 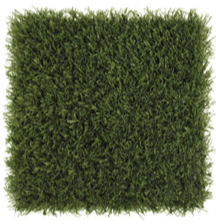 See our range of synthetic grass products that are designed specially for playgrounds. 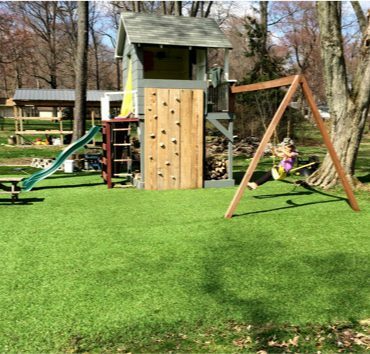 Playground Grass Extreme is the product that started it all. Made up of two types of blades, it incorporates high durability and realism into one quality product. A combination of straight and curled blades help fill the product and reduce infill flyout. Playground Grass Discovery was designed with smaller children and unique indoor environments in mind. 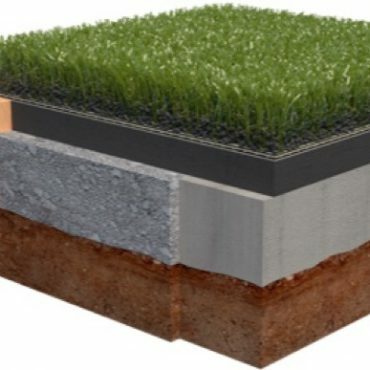 This is as durable as they come while featuring the use of soft XP fibers constructed in a short, dense product (with a thatch) that eliminates the need for infill. 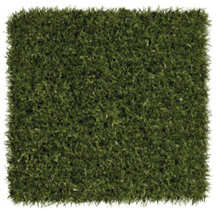 Playground Grass Academy combines several different features to move it to the front of the class in playground surfacing. Taller XP blades mixed with the natural appearing tan thatch provide the ultimate in realism with a highly durable construction. The tan thatch also provides for the “hide and hold” feature related to infill. 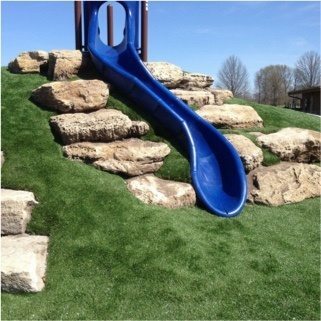 Playground Grass Ultra uses lightly-textured polyethylene blades with a textured nylon thatch zone to create a full, dense, and safe product. The fullness comes from the construction, and the additional safety is a result of the AlphaSan® antimicrobial and XStatic™ antistatic technology that is manufactured into the blades. Groom fibers twice a year with a power broom weed whacker attachment to stand fibers back up. Must be groomed monthly with a special groomer to lift, agitate to fluff the blades back up. Should be raked every night to keep for safety. Loose fill must maintain 12" depth for fall protection under equipment. We back our product with a 10-year warranty. 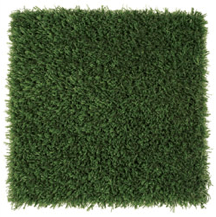 Other artificial grass products last less than 5 years. New rubber mulch must be added every other year to maintain depth and safety. Must be place every year and may need top-dressed throughout the year to maintain depth and safety. Community parks to school playgrounds, daycares to airport play areas, the uses for Playground Grass are limited only by your imagination. Get ideas for commercial use applications and be inspired by some of our favorite projects. Create beautiful, safe, low-maintenance play areas around your home. 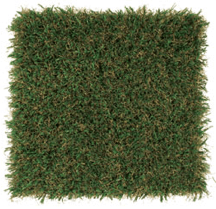 Playground Grass is hypoallergenic, static resistant, and soft to fall on. See how others have used it to create ideal play spaces around their homes. 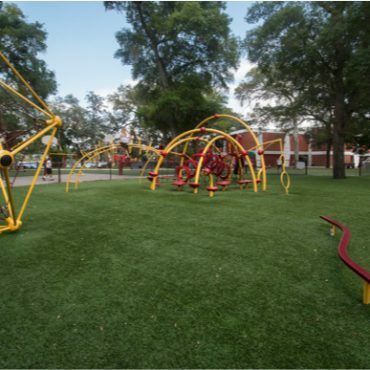 Take a closer look at the architectural specs for Playground Grass, including CAD drawings, specifications, and related documents. Our manufacturer-specific product information will help you advance your project plans. ForeverLawn understands the investment involved in playground projects. That is why we’ve partnered with North Star Leasing Company to offer a tremendous financing option for your synthetic grass surfacing. Check out the advantages.